Brother ADS-1100W-Scanner saves desk space with its small footprint, and saves time by automating repetitive tasks. It creates crisp, clear images and easily readable text on the first scan. Save space — Compact, highly portable design takes up less desk space. Save time — Smart Touch performs multiple-step scanning and organizing operations automatically. 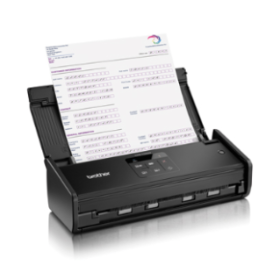 Scan it all — Reliably handles a wide range of documents with the 20-sheet automatic document feeder, including extra-long documents, business cards, ID cards, and embossed hard cards. Stay in contact — Bundled software helps you easily edit and synchronize business card info with your contact applications. 216 mm x 1651 mm (8.5 in. x 65 in. )/80 mm x 52 mm (3.2 in. x 2.1 in. ).